To create a subscription invoice, first create a document template, which will serve as a basis for your subscription invoices. To create a document template, click on the Documents menu then click Create a template. Choose the price category in the window that appears and fill in your document as you would a normal document. Important: You can use dates variables in the description fields of your invoice. 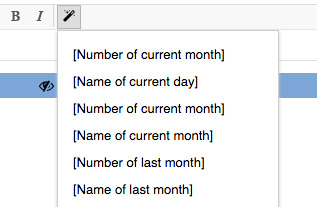 You can very easily add date information to be replaced to generate the document. For example Here is your bill for [name of current month] will be replaced by Here is your bill for April if your invoice is generated in April . Being a example, no customer information is displayed. Remember to fill in a name for your template . Once saved, the overview of the model is displayed. In the left menu click Create a subscription. In the next window, you will define the characteristics of your subscription. Choose the customer information. Note that you can change the informations during the course of the subscription, eg if there's a contact change. The mode of generation is an important choice, two options are available to you . 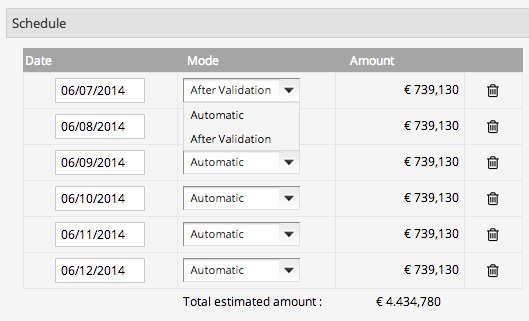 After validation: the invoice is generated as a draft, it will be up to you to send it. An alert email is sent to warn you. Just below other settings are available. You can select the recipients, and the email template used. You can also choose the payment method to use. You can then dynamically link catalog prices to the subscription invoice. 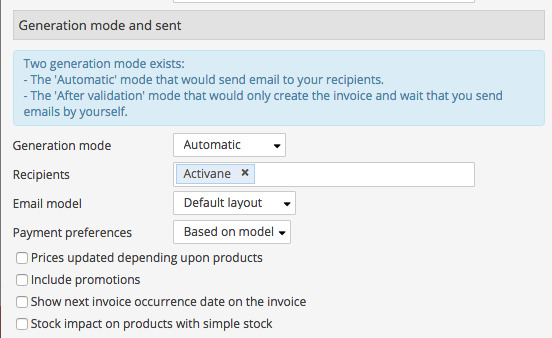 If you select this option, the invoice will be generated by taking the price of products on the day of invoice generation. You can also choose to take into account any discounts on your products. In this case, if the discount is active at the date of the invoice, it will be applied. The next option allows you to display the date of the next invoice on your document. You may now proceed to the programming of the subscription. You must indicate the start date (the first generation), the number of invoices and the frequency. You can also choose which day you want to send your invoices. You can now click on Generate the schedule. The schedule is displayed. You can adjust the dates or send mode if necessary. Once everything is OK, click Save, your subscription is created.